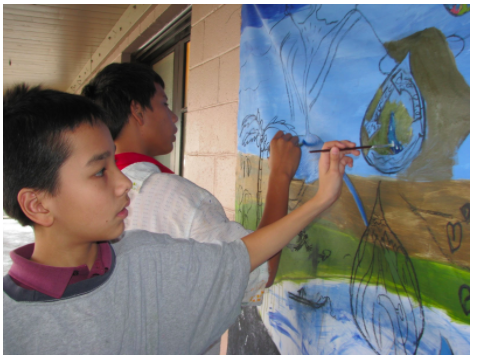 Linda Inlay started an independent school in Hawaii in 1986 called Ho`āla. Ho`āla in Hawaiian means, “awakening of the self,” an apt name for the transformation of teachers, students, and parents to grow in the Four Rs: responsibility, respect, resourcefulness, and responsiveness to be modeled by the adults in order to foster these same values in the students. I began my career as an educator at Our Lady of Schools in Wahiawa, Hawaii, where I learned a new way of orchestrating a school environment to nurture the well being of students into model citizens. At Our Lady of Sorrows School, Sr. Joan Madden and an Adlerian psychologist, Dr. Raymond Corsini collaborated to create a revolutionary educational program then called Individual Education. Using Adlerian principles and Carl Roger’s self-actualization theory, this program emphasized the core values of the Four Rs: responsibility, respect, resourcefulness, and responsiveness to be modeled by the adults in order to foster these same values in the students. After fifteen years at Our Lady of Sorrows School, I left with teachers and parents in 1986 to open an independent school called Ho`āla. 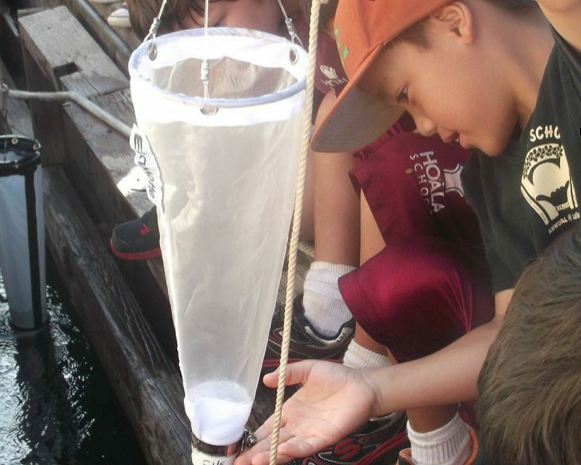 Despite huge obstacles to establishing itself, Ho`āla has celebrated thirty years of existence. Ho`āla in Hawaiian means, “awakening of the self,” an apt name for the transformation of teachers, students, and parents to grow in the Four Rs. In 1988, I left Hawaii for California, teaching for the first time in a public middle school. 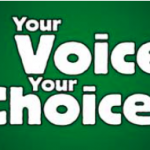 Through the experience of public schools in contrast to Ho`āla, I understood the power of Awakening Wisdom in making a positive difference in the lives of students, parents, and teachers. 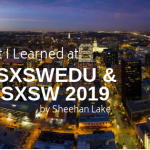 From this knowledge, I explored the kind of school setting, the hidden curriculum, that best supports the humanity of students while earning her Masters in Educational Foundations from the University of Hawaii in 1995. My thesis, Ho`āla School: The Transformation of Character Through the Implicit Curriculum, continues to be used as a training guide for teachers at schools. 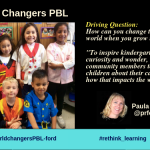 In 1993, my husband and I moved to the Napa Valley where I taught in the Gifted and Talented Education program in the elementary schools, using project-based learning and the constructivist theory as the basis for the curricular design. I was asked in 1996 to become the principal of River School, the first charter school in Napa County, a middle school, and one of the first one hundred charter schools in California. Over my eighteen years as director/principal at River School, I continued to develop the principles and structures of Awakening Wisdom. I also taught the principles of Awakening Wisdom in parenting classes each year so that home and school collaborated to raise self-assured, responsible, and respectful students. 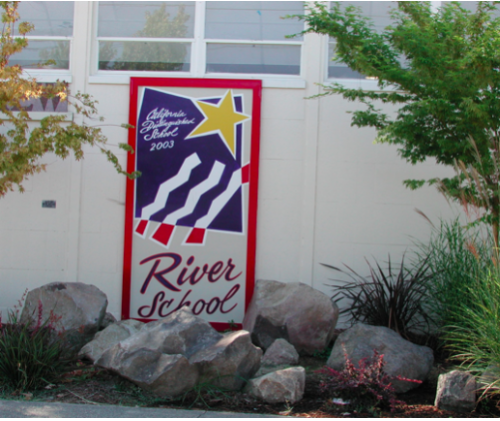 During my tenure, I led River School to receive two California Distinguished School Awards, the Promising Practices Award and National School of Character Award from the Character Education Partnership, and the California School Board Association’s Golden Bell Award. 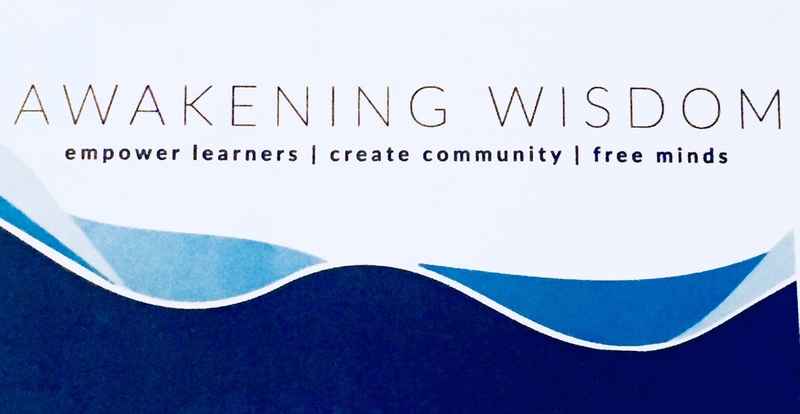 In 2016, the name of the program which began as Individual Education and later changed to Ho`āla Educational Philosophy was changed to Awakening Wisdom, a “way of being” exhibited by students, parents, and educators that foster the Four Rs, the core values of responsibility, respect, resourcefulness, and responsiveness. 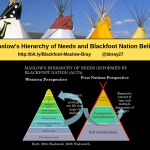 Awakening Wisdom is a way to organize the entire environment so it nurtures the need for social-emotional connection as well as the skills. 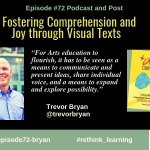 All students, actually all human beings, need a sense of belonging to feel connected. Another thing we know is that need to develop one’s identity and autonomy. River School was developed with these needs in mind there would be relationships along with an advisory program where advisors would build relationships with their students. Small groups of kids would meet with the advisor once every two to three weeks and listen to each other. Listening helped kids learn about who they are, to listen to each other, and feel that sense of connection when being heard. The need to connect with others is really important. Kids, most importantly, need to be listened to by adults and build trust. When visitors would come to the River School, a team of eighth graders would be responsible for leading the tour, answering questions, and speak from their heart about what they knew about school. 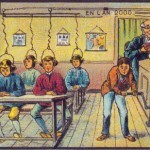 Visitors have said that the student tour guides were more self-actualized than many adults they knew. The 4 R’s really helped to develop their character. Responsibility is not just doing the right thing. It’s a unique definition of the willingness to see oneself as the cause of something rather than the victim. Our 6th-grade teachers carry the load and use the listening groups to nurture their voice. There is an invitation for them to speak up. On the first day of school, eighth graders would talk to the sixth graders sharing their wisdom and what is really important to know about the school. We send messages to the students to share their thoughts and ideas. Just because of the way they share themselves. There was a sense of confidence that they exuded when they went to the high school. They gained that sense of who I am, where I’m going, and what I want to do. The high school teachers remarked that they could which students came from River School because of the way they carried themselves even though there were only 400 students among over 2,000 high school students. Our core values, the Four Rs, reflect these understandings and show up in our speaking and in our actions. Responsibility – the power of the individual, the keystone of the Four Rs. Respect – the balance of power between individuals. Resourcefulness – the spirit of how we will interact with one another in our work. Responsiveness – a systems mindset of interconnectedness and interdependence. 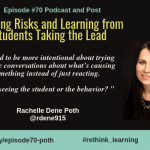 Linda shares more stories in the podcast about how students know when adults don’t “walk the talk,” about the “hidden curriculum,” and what happens when there is “Passion plus Purpose.” Make sure you listen to the whole conversation. 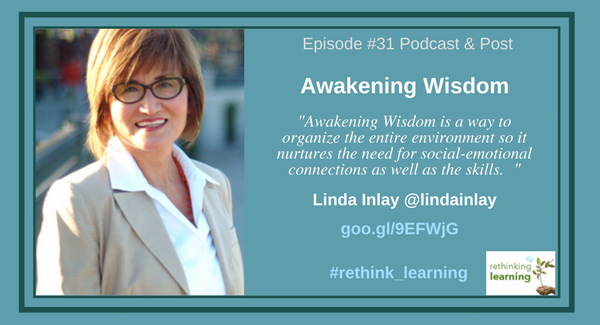 Linda Inlay is a teacher, presenter, and visionary who believes all students. She has presented at numerous conferences: National Middle School Association, Character Education Partnership, California Middle School Association, National Charter Schools, California Charter Schools Association, North Coast Educational Summit. She has written grants totaling over $300,000, including a Charter School Dissemination Grant to share Ho`ala, and authored four articles published in ASCD’s Educational Leadership. She organized and presented at three Summer Institutes on Awakening Wisdom. She has consulted with Reach Charter School in Sebastopol that adopted Awakening Wisdom and is currently consulting and coaching the Napa County Court and Community Schools. 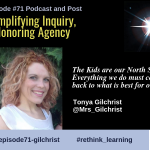 Creating a Culture of Respect through the Implicit Curriculum. Middle School Journal Vol. 47. Issue 2, 2016.